The second public building in the city of Mandan (after the log cabin county courthouse) was the Emerson Institute. The Emerson Institute had its origin in "a debating society which was conducted for the mental recreation and imporvement of the first settlers of the town." Finished in the fall of 1882 only 3 years after the founding of the city, Frank Mead, Michael Lang; B.L. Winston and P.O. Chilstrom all contributed to the purchase of the land. Donations were solicitied from the general community to raise $3000 ($75,000 in 2015$) to construct the original 36 by 80 foot wood building. It contained "all the modern improvements, tastefully painted and finished" including a ticket office on the right and a waiting room / ladies dressing room on the opposite side. 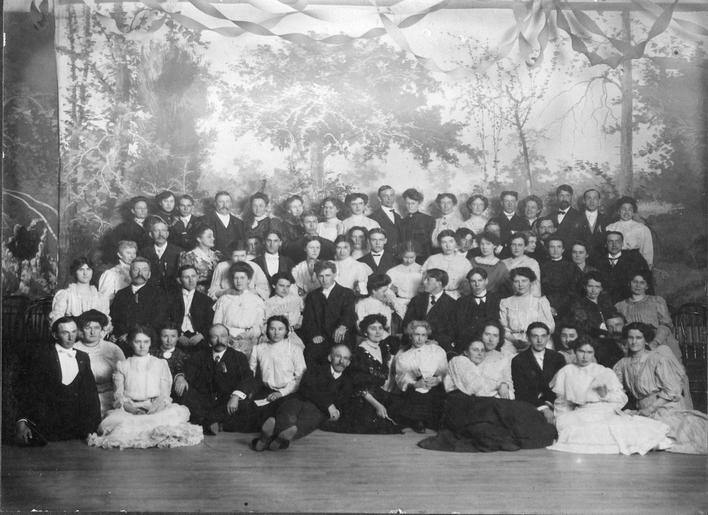 The service of the building was described in the February 18, 1882 Mandan Weekly Pioneer: "The theater, though on rare occasions in the use of traveling professionals, is almost entirely in the hands of the Mandan dramatic club, whose members are the very cream of this city. They give frequent and most enjoyable amateur performances. The existance of such a society in so young a town as this is especially significant, as it speaks volumes as to the prosperity of the inhabitants who are so favored that they may safely unbend their minds, relax in the rigid pursuance of their avocation and let pleasure attend upon the cares of business, which makes the third feather in the cap of all Mandanites." 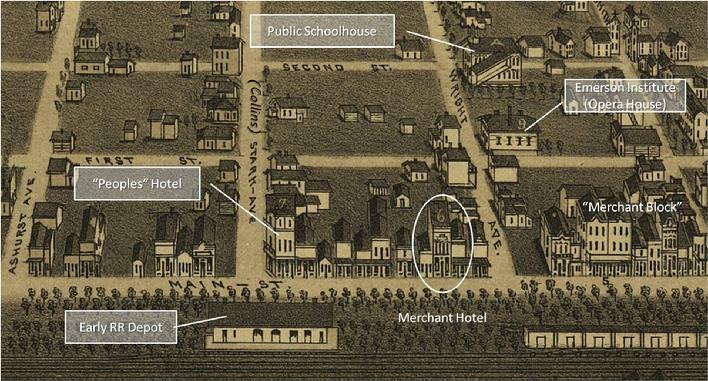 The venue was further highlighted in the 1884 Mandan Pioneer Immigrant Edition, touting the cultural and social activities associated with a city of 2500 only three years in existance. The original east end stage was described as "large enough for all ordinary purposes," being provided with scenergy, foot-lights and all the accessories necessary for a "first class proscenium." Tuttle and Wilson were the original facility managers; but by 1884 H.R. Lyon had assumed the role as manager. The venue was listed in national theatrical guides as originally having a 30' x 40' stage, with a proscenium with 20 wide feet and height of 12 feet. It had seating for 300 (with chair rental available through Binginheimer & Taylor's Drug Store) and piano and scenery was available on-site. The building was a civic highlight of the Souvenir Book published in 1906 to promote the City of Mandan and the economic opportunities available here. Events included 4th of July and New Year's Eve dances plus live performances which ranged from serious drama to vaudeville acts. Basketball games, graduation ceremonies and public meetings were also held at the site. A major addition to the east side of the building was completed in the Spring of 1893, expanding the stage and backstage areas and increasing seating to 500. 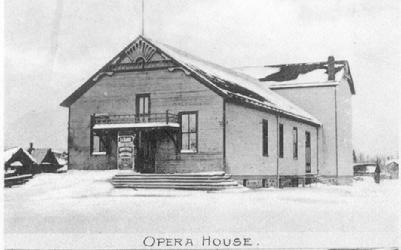 The facility was renamed the Opera House with the completion of the addition. 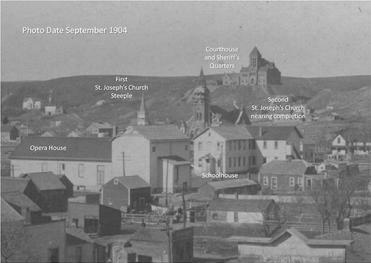 The building was home to a wide range of social and cultural events during 1880s through 1920s. High school athletic events were moved to the gymnasium at the school upon its construction in 1919. With the opening of the Palace Theatre on Third Ave NW between the Lewis and Clark Hotel and the Hotel Donaldson in December 1916, it became far less popular for live entertainment. Upon construction of the World War Memorial Building (today's City Hall building) in 1934, the need for the venue diminished and the building was torn down.